This post is sponsored by Crystal Farms Cheese. All opinions are mine alone. 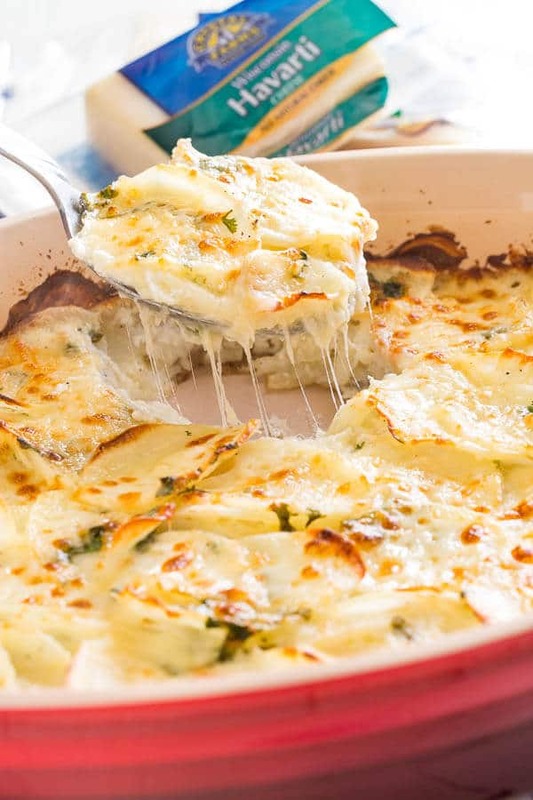 This family favorite cheesy scalloped potatoes are famous for its creamy richness and delicate cheesy layers. 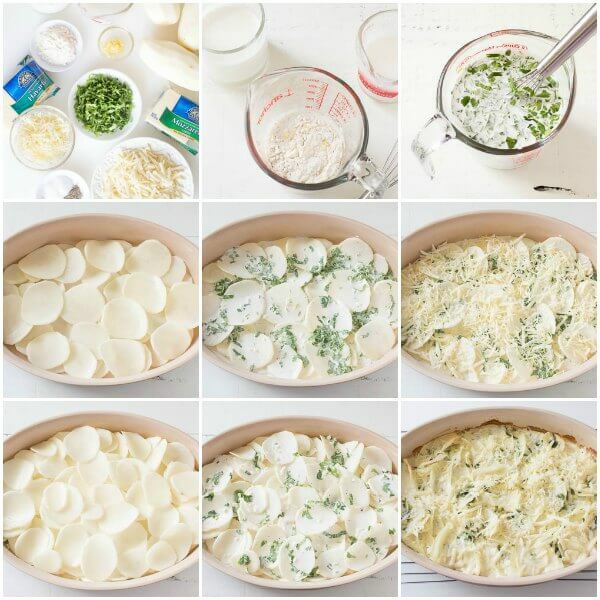 Excellent make-ahead side dish for a crowd! Every holiday menu should include killer sides! Hearty salad (preferably this one), stuffing, baked sweet potatoes with toasted marshmallows on top (that crispy gooey marshmallow is the best!! ), fluffy mashed potatoes, green bean casserole, creamed corn, scalloped potatoes… As you can see, I’m obsessed with sides. Give me little bit of everything! …Except, don’t serve mashed potatoes and scalloped potatoes on the same day. It’s too much even for a potato lover, like me. Anyway, with so many dishes to prepare, you’ll appreciate all the make-ahead dishes. Am I right? 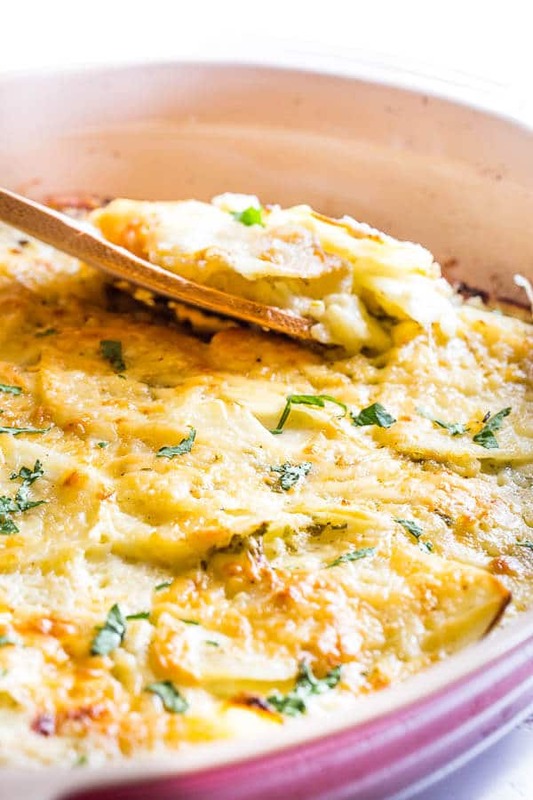 And this creamy cheesy scalloped potatoes are just that. You can prepare everything a day ahead, and throw it in the oven the day of. Easy-peazy, and delicious! I’ve partnered with Crystal Farms Cheese, one of the largest cheese brands in the country, to bring you delicious cheesy recipes over the next few months. Because, you know, I’m a little crazy about their cheeses. And first up, this crowd-pleasing cheesy scalloped potatoes, filled with ooey gooey cheese, is on the menu. This time, creamy buttery havarti and ooey gooey mozzarella run the show. Both cheeses melt beautifully and add nice creaminess to the dish. Plus, combination of 2 different cheeses adds more flavor. And flavor is everything! Slice the potatoes as thin as possible. Combination of milk and heavy cream gives us best of both worlds. Nice and creamy, with a little less calories. I’ll take that as a win! And here’s step by step visuals for you. Preheat the oven to 400°F (200°C). Spray at least 2-inch deep large casserole dish with cooking spray. In a medium bowl, whisk together ½ cup of heavy cream, flour, garlic, salt and pepper until well combined. Stir in the remaining heavy cream, milk and cilantro. Arrange half of the potatoes in prepared baking dish. Sprinkle half of each cheeses in even layer. 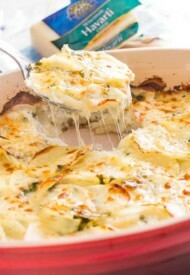 Layer the remaining potato slices, pour the remaining cream mixture and sprinkle the cheeses. Remove the foil and bake another 20 minutes, or until the potatoes are fork-tender. If desired, broil for about 2 minutes for beautiful golden color.